Thai wrap shorts! 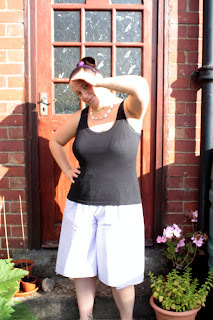 I adore Thai wrap trousers, I thin they are so very comfy and they are much easier to sew than fitted trousers. This short version has sat in the UFO pile for a year due to me making the crotch seam too short. But they are finished now and I am really pleased with them. They were made of new material I'm afraid but the ribbon I used for the ties was stash and the white cotton I used to add length at the waistband was also stash.